St Cuthbert's Swim School – proudly teaching babies and children, and coaching adults from all around Auckland. St Cuthbert’s Swim School’s state-of-the-art pool facility offers an optimal learning environment with a dedicated Learners’ Pool to build confidence quickly. More assured swimmers graduate to the 25m, eight-lane Main Pool to perfect their technique. We are very pleased to advise that our babies’ bookings for next quarter/term are now open. The Quarter 2 runs between 29th April and 21st July. We also extremely excited to let you know that we will be running a winter promotion for our babies. The promotion will take place in Quarter 3 from July 22nd to October 13th. Our babies programme is highly popular and spaces are limited. We highly recommend to book your baby NOW in order to ensure his/her space in the HALF PRICE lessons in Quarter 3. To enjoy this opportunity please email us NOW at: [email protected] . If you can supply us with the following details and whether your little one has had any previous swim lesson experience we will then be able to provide you with the appropriate timetable. Child name and date of Birth. Looking forward to seeing you at the pool! At the St Cuthbert's Swim School we believe that all Kiwi kids should be able to swim and be safe in the water. Our week of school holiday programme aims to provide your child with rapid improvement in a short space of time. Children attend daily classes, covering half a term's worth of learning in just one week. 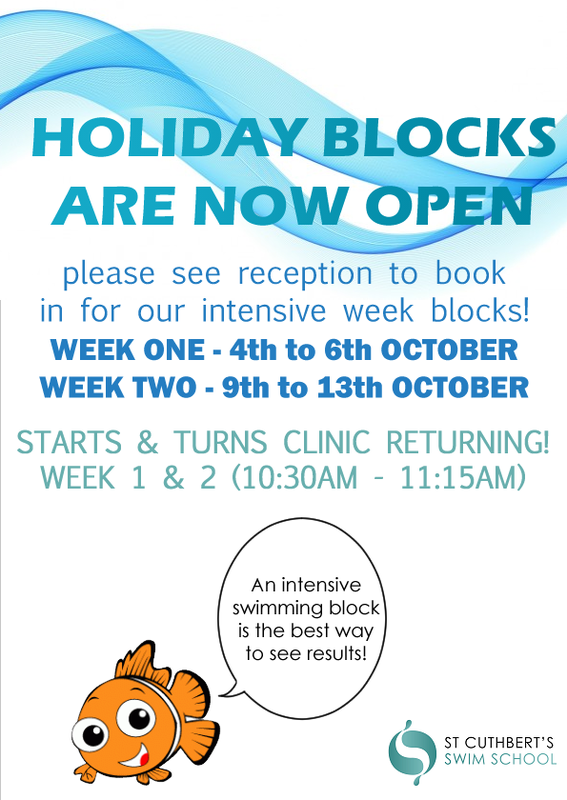 The holiday block will run from Monday October 1st to Friday October 5th. Based on age and ability you can register your child to our preschool and school age sessions. Our Free Babies Lessons Are Back!!! Got a water baby? Indulge their love of the water with free Parent and Baby swim classes in Quarter 3 (July 23 to October 14). These lessons focus on getting your baby comfortable in the water, teaching basic co-ordination and early survival skills. What’s more, because you’re in the pool with them, it’s a great bonding experience. Comfort for you and baby is paramount with our Learners’ Pool set to a higher temperature and UV-treated water for reduced levels of chlorine and less irritants for sensitive young skin and eyes. Places are limited so book now by calling 520 8272 or email [email protected]. The awards were presented to our staff members during the annual NZSCTA conference in Auckland. We also won both awards in 2017 so to be able to keep the trophies in 2018 gives us great joy. We would like to take this opportunity to thank all of our amazing customers for all of your support. Teaching your kids how to swim and how to be safe in and around water is what we are passionate about. Thank you for giving us the opportunity to do so. At the St Cuthbert's Swim School we believe that all Kiwi kids should be able to swim and be safe in the water. Our two week-long school holiday programme aims to provide your child with rapid improvement in a short space of time. Children attend daily classes, covering half a term's worth of learning in just one week. All children will learn from our expert instructors with other kids of a similar level of swimming. Spaces are limited so don’t delay, book your child’s place today by calling 09 520 8272 or emailing [email protected]. We are very pleased to advise that our babies’ bookings for next quarter/term are now open. The Quarter 2 runs between 30th April and 6th July. We also extremely excited to let you know that once again we will be running a free of charge lessons for babies in Quarter 3 between 23rd July and 14th October. Our babies programme is highly popular and spaces are limited. We highly recommend to book your baby now in order to ensure his/her space in the Free lessons in Quarter 3. Childs name and date of Birth. At the award winning St Cuthbert's Swim School we believe that all Kiwi kids should be able to swim and be safe in the water. Our two week-long school holiday programme aims to provide your child with rapid improvement in a short space of time. Children attend daily classes, covering half a term's worth of learning in just one week. Summer is on its way and with it the opportunity for Kiwis to hit the beach, the pool or the lake and take a dip as we enjoy the warmer weather. With all this aquatic fun ahead, now is the ideal time to ensure your child can confidently enjoy the water. Our school holiday programme is designed to rapidly improve water skills, with children attending daily classes and covering half a terms worth of learning in just one week. You can register your child for our Preschool and/or school age sessions for the entire week or for the days that suit you (a minimum of three days). All children will learn from our expert instructors in small groups with other kids of a similar age and stage. Spaces are limited so don’t delay, book your child’s place by calling 09 520 8272 or emailing [email protected]. Payment to be made upon booking. Got a water baby? Indulge their love of the water with free Parent and Baby swim classes in Quarter 3. To take advantage of this fantastic offer simply register your child (aged 3 - 36 months) for swim classes in Quarter 2 and receive lessons at no cost in Quarter 3. Places are limited so book now by calling 520 8272 or email [email protected]. To view dates and terms and conditions please click here. Contact us to find out more about lessons, to arrange a free swim assessment for your child/ren and to make bookings.